^ Child, Ben (31 July 2013). "Richard Curtis: 'About Time will probably be the last film I direct'". The Guardian. ^ Chang, Justin (27 March 2012). "Deschanel, Gleeson on 'Time' for Working Title". Variety. Retrieved 8 September 2013. 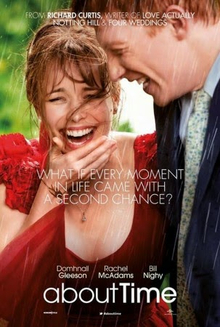 ^ "Film4 Summer Screen: About Time Competition". Channel 4. Retrieved 8 September 2013. ^ 김, 진성. "'어바웃 타임' 300만 돌파, '로코' 흥행 기록 다시 썼다". TV Daily (in Korean). Archived from the original on 18 March 2014. Retrieved 5 January 2014.